BENEFITS: Over thirty years ago, the Food for Health Institute, with Yerba Prima, developed the first Internal Cleansing Program. Now, we have developed an improved, more powerful Men’s Rebuild® Internal Cleansing System based upon over thirty years of experience and clinical research. Yerba Prima Internal Cleansing includes the latest knowledge from Ayurvedic, Chinese, European and Native American traditions in a complete cleansing program. Only Yerba Prima Internal Cleansing includes Great Plains® Bentonite for added detoxification. Men today are exposed to high levels of stress, as well as unavoidable pollution, in our busy lives. It doesn’t matter if you are a bodybuilder, a weekend athlete or just out of shape. Anyone can benefit from the elimination of waste and toxins with internal cleansing. For vitality and better health, internal cleansing can help! Men’s Rebuild® Internal Cleansing System combines 30 of the finest cleansing and vitalizing nutrients from the world’s great healing traditions. It really works and is simple to use, whether you are trying internal cleansing for the first time or are an experienced user. Our more concentrated and powerful three-part herbs and fiber program gives a gentle yet thorough cleansing of the colon and the entire body. 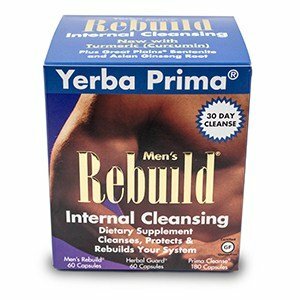 The Men’s Rebuild® Internal Cleansing System consists of three products: Men’s Rebuild®, Herbal Guard® and Prima Cleanse®. Men’s Rebuild is an easy program to follow, whether you are cleansing for the first time, or are an experienced user. It provides a gentle, thorough, total body cleansing, plus protecting and rebuilding of the elimination systems. 8 oz. (a full glass) of liquid. Drinking additional liquid is helpful. CAUTION: Keep out of the reach of children. Do not take capsules if you have difficulty in swallowing. A very small percentage of individuals, particularly health care providers who have been occupationally exposed to psyllium dust, may develop an allergy to psyllium. If you experience a strong allergic reaction, with difficulty in swallowing or breathing, seek immediate medical attention. NOTICE: This product contains senna. Read and follow directions carefully. Do not use if you have or develop diarrhea, loose stools, or abdominal pain. Consult your physician if you have frequent diarrhea. If you are pregnant, nursing, taking medication, or have a medical condition, consult your physician before using this product. red clover tops extract 4:1, corn silk extract 4:1. Other Ingredients: Rice flour, cellulose, maltodextrin, USP Kosher gelatin capsule.